The laser-cut, chrome-molybdenum steel trellis frame, welded to the highest standards, contributes to excellent chassis geometry. It's extremely stable and weighs only 9.8 kg, which helps keep the overall weight down: 212 kg (ready to ride, without fuel) and 228 kg fully fueled and ready to race the sun. 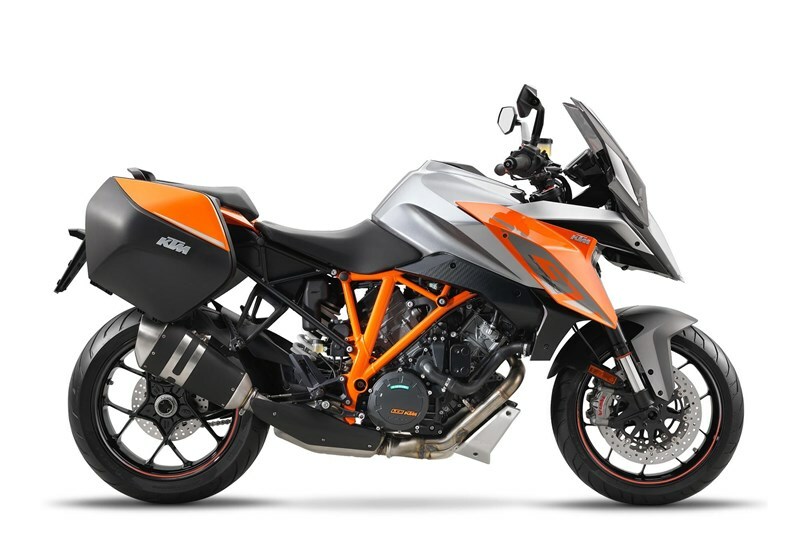 The jaw-droppingly beautiful, light alloy, single-sided swingarm on the KTM 1290 Super Duke GT is not only the lightest in its class, but also meticulously manufactured and generously dimensioned – a reassuring partner when the Super Duke GT unleashes its full potential. The rear wheel is fitted to an axle that is 50 mm in diameter and bolted in place with a 60 mm central wheel nut. A high-precision, eccentric adjuster is used for tensioning the chain. More than adequate deceleration is ensured at the front wheel by the two radially mounted Brembo M50 four-piston Monoblock calipers, actuated by a radial brake pump, each gripping onto floating 320 mm discs. The spacing between hand brake lever and handlebar is adjustable so that the lever is within easy reach for every rider. The front brake receives effective support from the disc brake on the rear wheel, which features a 240 mm diameter disc and a two-piston Brembo caliper. The enormous potential of the Brembo brakes can be exploited to the full thanks to its sportily tuned anti-lock braking system. The ABS even has a supermoto mode, for when you absolutely feel like backing it in while on holiday. The Pirelli Angel GT’s on the KTM 1290 Super Duke GT offer eager steering, with a broad grip range and fantastic stability. These tubeless sports tires are fitted on alloy rims manufactured in a low-pressure die casting process. Not only do these featherweight wheels make the bike lighter overall, they also minimize the unsprung masses and moment of inertia, with a positive impact on the handling and ride dynamics. With so much propulsive power, the front wheel could become very light, which could quickly lead to unpleasant kick-back on uneven roads or following a slight stimulus at the handlebar. The Super Duke GT prevents this safely with a reliable and sensitive WP steering damper.